Your content is good, sometimes even great and occasionally awesome – however, how do you create amazing content that becomes shareable content? Creating amazing content is a conscious choice. Content marketers make this choice every day, as they decide what to craft and publish on their organization’s blogs and social media platforms. They know what great content is. It is stuff that educates, entertains, or inspires their readers and followers; it is content that gets conversions. It is content that is published on a regular basis, as their followers have come to expect. And it is content that will be responded to and shared. The problem is this: There is a lot of great content out there – new content that is published every day. To stand out among the others means to go beyond the “great” and to enter the realm of “amazing,” (or awesome) that place where content is so engaging and compelling that readers cannot ignore it and must share. How do you get to this place? 9 Simple Steps to Shareable Content Your Readers Will LOVE! There is a tendency to look for content that others have written and to simply re-write it and publish. If the original content is a month or more old, then others have done the same thing, and it is not new. Researching what others have written can give you great topic ideas, but find a way to make it unique and add something new. If your content is “worn,” no one will continue to follow you. Things You Can Do: Take great content and turn it into and infographic or a set of slides. Find visuals as examples, or make the content interactive in some way. Getting visitors/readers engaged takes more than just re-purposed content. 2) Shareable Content Has Killer Headlines! These are the facts: 80% of the people who are exposed to your content will read your headline. Only 20% will then click through to read the content itself. Your first job is to get that click-through, so the headline has to be really compelling. 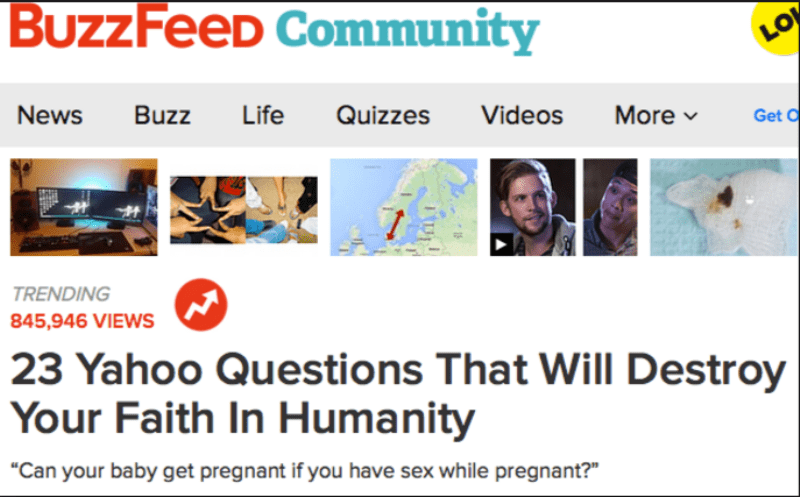 Here are a couple of examples from Buzzfeed and Upworthy. Note that his headline has a number in it (an odd number is always better), it is in the “LOL” section, and people expect to be entertained. When they then read the first sub-heading below, you realize that you are going to get a good laugh from reading these questions. So, you click through to see how “dumb” people really are. The post was obviously wildly popular – look at the number of views. Upworthy often posts more serious content – inspirational, poignant, etc. And they also have lead-ins that are just as engaging. In this case, the content is a video, but the lead-in is just great, giving the reader a teaser for what is to come at various points throughout the video. Once you have your amazing headline, your first sentence must be just as awesome. And the next one as well. Your sub-headings should clearly tell the reader what is in that section, but they should be catchy as well. Most text content readers will scan and “snack” on what is written. If the content is an infographic or some other visual, they will stick around and take it in, if it is of value to them. You next job, then, is to make it valuable, so read on. Nothing is more frustrating for a viewer than to get a good piece of content with advice and recommendations and then no tips or examples, so that s/he can then do something with that information. If, for example, I tell you that a great way to gain readership is to create interactive content – quizzes, polls, surveys, videos, etc. – and I leave it at that, your next question is, “How do I do that?” If I don’t tell you, then what’s the point? You probably will not want to come back for any more of my content. You will look for someone who will tell you how to do this. 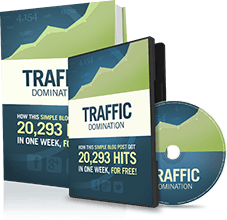 If, on the other hand, I give you plenty of examples and then point you in the direction of sites where you can create these types of content, you now have something actionable. And if I give you a short description of these sites (e.g., are they for beginners? Are they free? ), then you have even more information that will shorten your exploration. You have no credibility unless you can back up data and statistics with actual research. And you need to provide links to that research, so that your viewers can check those and get even more information on the topic. 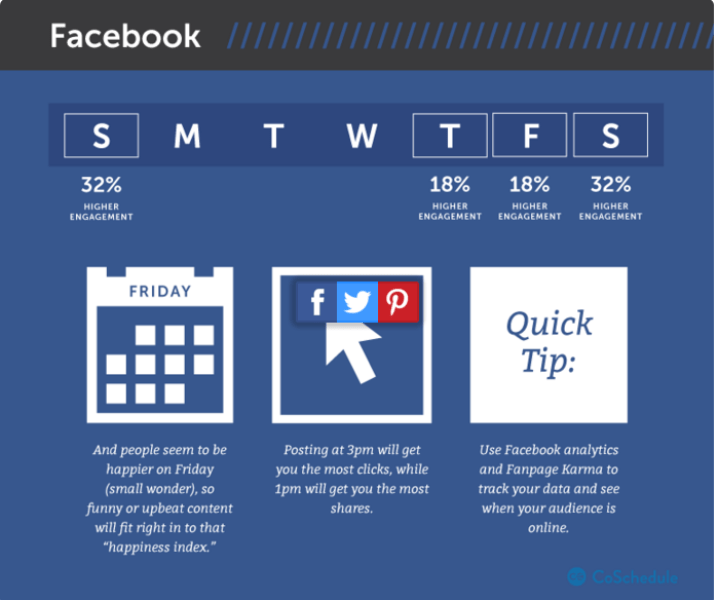 If, for example, I tell you that Thursday – Sunday are the best times to post on Facebook, and that there are actual times of the day to post certain types of content, then I should include a link, like the one here, or post the stat itself and provide the source. coschedule.comNow, the post has filled in an “information gap” for the reader, has resolved a question with a solid, research-based answer. The important point is this: Visitors and followers have to trust that you can relieve their pain points, provide accurate information, and fill in a hole in their knowledge. Not all of your content may be instructional or informational, but when it is, be the “go to” source, and your readership will grow. => If text, reading level should be simple – about the 7th grade level. Check everything you write using a tool like Read-able.com, to gauge the reading level of your content. Communication skills that connect with your specific audience is your first goal here. => Tell Stories: Readers love stories. If content can include stories about your company, your team, and your customers, you will gain readers. And you can tell these stories in many ways. Instagram and Facebook are great places to provide photos with captions and links to your site landing pages, as is Twitter. Stories don’t always have to be in text form. And any blog post you write can be filled with stories and anecdotes to demonstrate the point you are making. 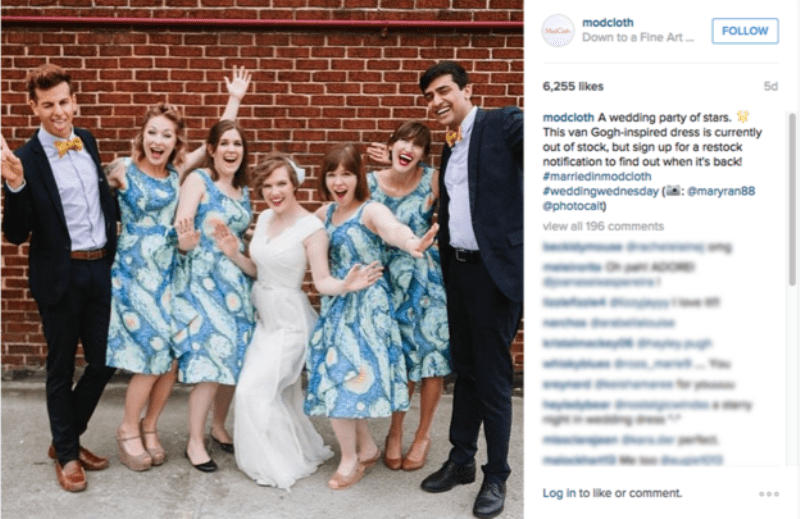 Here is an example of ModCloth telling a story of a wedding on Instagram, featuring the bride’s and attendants’ apparel purchased from its store. => Ask questions at the end of a post. If you do, you will encourage comment and feedback – just what you want. The more conversation you get, the more search engines will pick up that your content is important and being updated. Your content does not always have to be serious. In fact, it shouldn’t be. When you can actively involve your readers in your content, the chances of them getting excited about it and then sharing rise exponentially. Consider Philips Razors. Now, razors are not exciting and amazing products. But this company has found a way to make them fun with interactive posts. Visitors can click each of the beards and hear a different story about the guy’s night (he can’t remember). Each beard begins with him shaving in preparation for a night out and then the story of what happened. At the end, viewers are provided a CTA to sing up for the monthly shave subscription club. The video received millions of views and counting, and the average viewer clicked 3-4 of the beards to hear the stories. You have no doubt enjoyed the quizzes you have taken on Facebook or the memes with great sayings. Create your own using easy tools such as the links provided here. Here are a few statistics about visual content. If you want to learn how he did it, read his article full of hacks that can be implemented today. One of these hacks is to create beautiful images with an inspiring quote. 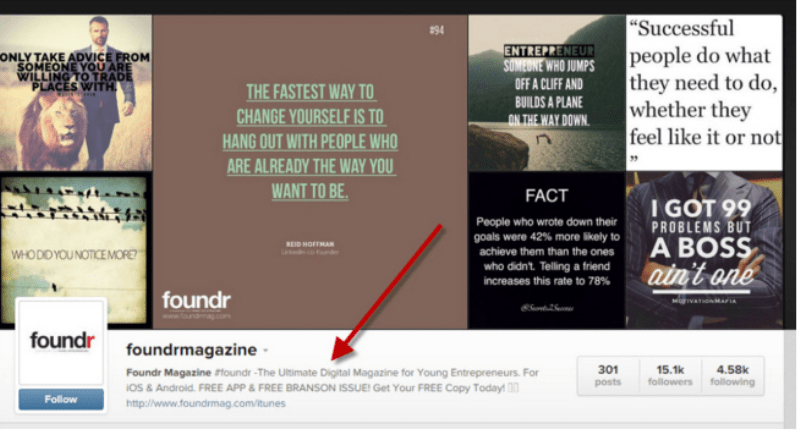 Like Foundr Magazine featured above, a lot of content marketers have found that they can develop connections and relationships with their target audiences by providing something of value totally unrelated to the product or service they sell. They grow a following pretty quickly because, if those images and quotes are amazing, they will be shared. People return to read the next one, so you must be very regular about posting – every day. When you have some down time, create a bunch of them for future posting. Once you begin this, you have to keep it up. Fortunately, there is no lack of great pictures, images, and memes to use and sites like “Brainy Quotes” will supply quotes on any topic. Onlinefun.com has over 2500 one-liner jokes. Know your audience well, and you can pick exactly the right ones to use. If you are creating blog content, and it is informational or educational, be certain to offer upgrades to readers who are willing to share their email addresses. 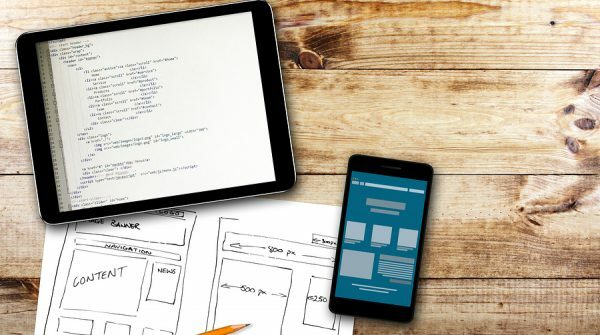 These can be anything from cheat sheets, which give a shortened version of the content with actionable tips, to PDF versions, to lists of resources – anything of value that a reader might want. Neil Patel is a master of this on his blog, Quick Sprout. He writes anywhere from 2,000 – 4,000 words in each post, and they are filled with amazing information, data and tips. However, he always offers a shortened “cheat sheet” version in exchange for a subscription opt-in. He knows that his audience members are often in a hurry, want the information, and are willing to opt-in to get it. His great content becomes amazing for his audience when it can get the condensed version. Paragraphs filled with text are not read, and no one will return, no matter how great the content is. Break it up. Use bold heading and bullet points. Break it up with images – several placed all along the way in longer posts. Great content turns into amazing content when readers can scan and find just what they want. It’s not whether they read your entire post. It’s that they can find something of value quickly, read it, and then come back for more because you do it right. Most of our content may already be great. You do the research, you find great topics, and you have a lot of value to offer your audience. 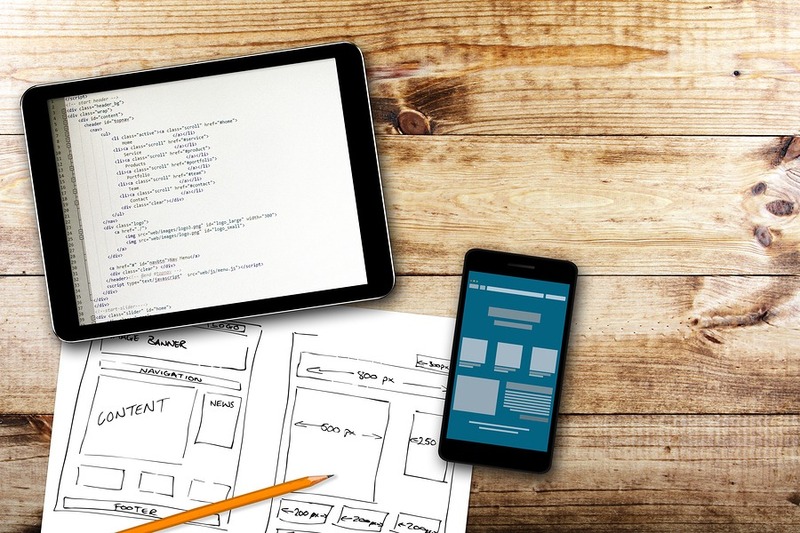 But you can make that content amazing by implementing these 9 best practices. Author Bio: Julie Ellis is a passionate blogger, marketer and traveler. Follow Julie’s Twitter to find out more about content marketing.